I have featured this sculpture on my blog before, but today I was looking at it with new eyes. I have been involved in CLMOOC and read Karen LaBonte's thoughtful blog post Pondering Remix. It made me think about ownership, about using other people's work with respect and about when it is appropriate and when it is not . 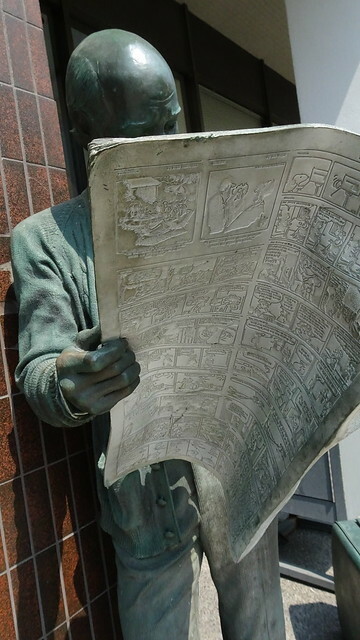 This sculpture is itself a remix - using an actual imprint of the newspaper of the day. If you go to the photo on Flickr you can zoom in and see it in more detail. Here is a detail - showing the back of the newspaper. Is this an infringement of copyright? 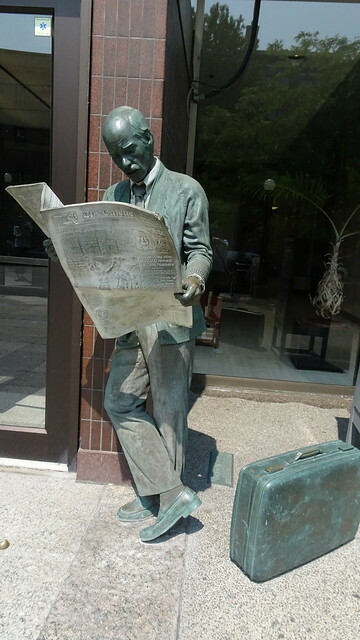 The sculpture is by John Seward Johnson and I discovered he has done a similar sculpture using a Philadelphia newspaper. We walk a fine line between what is acceptable and what is not and in this litigious society there seems to be a push to claim almost anything as something to patent or copyright. I was glad that the recent court case about Stairway to Heaven resolved that Led Zeppelin did not break copyright. What does it mean to “own” something composed we’ve composed? If we are remixing someone’s composition, then where does that ownership begin and end? Does it matter? (If not, why is intellectual property law such a booming field?) Is ownership in the intention or act of communicating? In the product? When is it honouring someone to do something "inspired by"? When is it just copying? In an era when it is so easy to take and remix, how do we teach students the importance of supporting artists (writers, musicians...) by paying for their work? I am all for a the concept of sharing. In fact virtually all my photos on Flickr are there with a creative commons license (I would like credit for them, though). I do think when I photograph artwork as above - how will this image be used by someone else? Will they give the artist credit along with the photographer? I would love to hear your thoughts. I was bothered a few years ago when I realized many of my photos were being copied and reused, mostly on Pinterest. However, I don't sell my photos and as a hobby photographer, I think I've come to terms about "sharing" my work. However, I would like credit when someone uses a photo, and I wouldn't like if they claimed the work as their own. I try to be careful about crediting sources if I use somebody's words or creation. There is just so much in the public domain now that I wonder if students today even think that it's wrong to use something they glean on-line. I had no idea about photos of the Eiffel Tower at night. In fact, a friend just sent me a couple she took - magical in the blue light of evening. PS I still keep the "do not copy" on my blog even though it's constantly ignored. I also watermark all photos I put on the blog or social media. Of course, watermarks are easily edited out, but I still imprint the photos with a copyright symbol, hoping to show ownership unless someone is truly unscrupulous. These statues are fabulous-- I have enjoyed just spending time looking at the photos of them, so thanks for posting. I am most struck by the thought of teaching students about the importance of compensating artists for their work. So, would it be OK to remix something, say, like the Mona Lisa? Guernica? I guess people have done it, but have they done it to be considered as serious art? This is such a complex issue in and of itself, and then if you address it in the context of educational settings, practices, goals, etc....whew. Glad to be on the journey with you! Karen - I'm also enjoying the journey. As to compensating artists - there is a limit to copyright. It's part of the when is it OK to use work and when is it not. Living artists should be compensated and acknowledged - the dead ones at least acknowledged. Remixes can be fine art - in my opinion - Respighi used music of the past in his own compositions: Ancient Airs and Dances, The Birds. Paintings have been inspired by works of other artists. There are always levels in the success of a remix - those that amplify and build on the work of others or comment on them and those that just are remixes for the sake of remixing and everything in between. I do think students have to be aware of the artists behind the work they are using.